When he arrived at Arsenal it would be fair to say that Andries Jonker caused something of a stir. In an interview with Dutch publication, Voetbal International, the new head of Arsenal’s academy laid out the problems in front of him and he did not hold back. 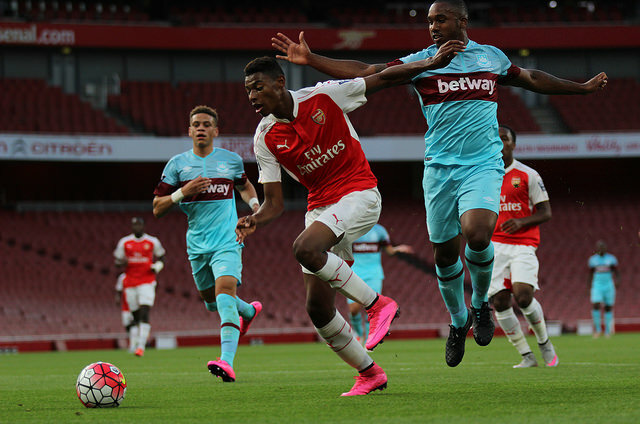 “Arsenal want more talented players to come through, because that has been lacking,” Jonker said in September 2014. “They want me to develop the players from the academy much better than it was done before. The sentiment that ‘players have hardly been developed properly’ seemed a harsh one, certainly when you consider the fact that Jonker was replacing Liam Brady, a man who had run the academy for nearly two decades. Under Brady’s guidance Arsenal had produced several talented individuals. The likes of Ashley Cole and Jack Wilshere were testament to the work done, but Jonker’s critical words did provide a level of scrutiny that perhaps indicated a worrying trend. The production line appeared to be grinding to a halt. The Wilsheres of this world were becoming an exception rather than the norm and following Brady’s decision to retire in May 2014, a new plan needed to be put in place. When Wenger first arrived the academy landscape was very different to how it is now. A quick glance at the facilities on offer at Manchester City today tells you all you need to know about the level of investment involved. Around the globe millions are spent by clubs hoping that extra funds will give them the edge when it comes to player development. This is a stark contrast to when Wenger took the reins at Highbury in 1996. During the early years of his tenure it was enough for Arsenal and the Frenchman’s reputation to persuade the best young players to come to Arsenal. Cesc Fabregas is the perfect example, but he is just one of many who were lured in by the prospect of working under Wenger. But now the landscape has dramatically changed. Wenger no longer has his pick of the best young players in Europe and instead the continent is awash with scouts from all of the Premier League. Chelsea, backed by their Russian billionaire, are one of those who have invested heavily in their youth setup. It is estimated that the Premier League champions spend around £7m a year on running their academy – that excludes any extra cash used on transfer fees and wages for youngsters. Those amounts can prove to be staggering. Indeed in 2014, the Daily Mail revealed 18-year-old Andreas Christensen was on £20,000-a-week despite not making a single first-team appearance. Arsenal were being blown out of the water by the financial clout of their rivals. There was also the small matter of Arsenal’s new stadium. At a time when the club were trying to pay off a huge construction bill and stay in the top four, it’s unsurprising to discover that they could not compete with others’ academy outlay. Spending on the future was understandably lower down the pecking order when it came to the club’s priorities as the present had to be secured first. But a lack of investment began to show. The results of the FA Youth Cup – considered by many a good litmus test of future talent within a club – demonstrated the shift in power. In 2009, Arsenal won the competition as the likes of Jack Wilshere and Francis Coquelin shone. Since then, the roll of honour has a different look though. Big-spending Chelsea have won it four times, while Manchester United have also lifted the trophy. New kids on the block Manchester City also made the final last year as the investment from their Abu Dhabi owners since 2008 began to pay dividends. This change in the academy landscape is something Arsenal are aware of though and it was highlighted by Jonker in that interview he gave back in September 2014. The realisation that money was needed has never been argued, but with a stadium bill and a need to finish in the top four it was hard for Arsenal to justify splurging on youth. Now, however, with their finances secure, the club can look to the future. Huge investments have been made on the club’s Hale End Academy, which is where Arsenal youngsters train until the age of 16. Similar improvements have been made at the team’s main training base at London Colney, which is where the under-18s and under-21s have their skills honed. In many ways Arsenal are playing catch up to their rivals, who have been pumping millions into their youth facilities over the past decade. Manchester City has now become an exceedingly desirable club for any future star, to the extent that their rivals Manchester United are playing second fiddle to them. Having personally toured the Manchester City training ground I can understand why any youngster wants to go there. The facilities on offer are comfortably the best in the world and even if a player does not make the grade there, they will have had an outstanding footballing education. It means that playing catch up for Arsenal won’t be easy, but Jonkers urgency to spend has not gone unnoticed. As they wait for the club to produce homegrown stars again, promising players are being plucked from around Europe. Vlad Dragomir is such an example. The 16-year-old was signed for £100,000 last summer from ACS Timisoara and has already been likened to Toni Kroos. A big amount was splashed on Ajax sensation Donyell Malen too, with Arsenal out gunning Chelsea by offering him over £10,000-a-week. Such a lucrative offer from Arsenal is an indication of how they are ready to return to the top table of academy football. The financial clout of their rivals which saw them left behind is a thing of the past and now is the time for club to return to the top when it comes to developing players. This entry was posted in NewsNow, The Bergy Blog and tagged Academy, AFC, Arsenal, Arsene Wenger, Finances, Francis Coquelin, Gunners, Jack Wilshere, Manchester City, Premier League, Wenger, Youth. Bookmark the permalink.